Summary: White Mischief is a look at a 1941 murder in colonial Kenya. The book works on two levels – as a picture of colonial aristocrats and as an unsolved, true crime. Unfortunately, some dead spots in the middle keep the book from being a complete success. Review: On 24 January 1941, someone murdered Josslyn Hay, a dissolute English aristocrat in Kenya. There was no shortage of suspects, but the crime was never solved. Years passed. In 1969, authors Cyril Connolly and James Fox began researching the case for a newspaper story. Finally, after Connolly’s 1974 death, Fox continued the research and eventually published White Mischief. Fox chooses to split his narrative into two parts.The first (pages 1-135) covers the murder and the life of the English colonials. The second (pages 137-318) covers Fox’s investigation. Unfortunately, the second part is far inferior to the first. Part I provides background on the protagonists. Hay (or Lord Erroll) is an unsympathetic victim – a man born to every advantage who squandered his opportunities and made a habit of using his good looks to seduce married women. His bad behavior was far from unusual in colonial Kenya. In fact, the depravity is astounding. One hostess, for instance, “…was only happy… if all her guests had swapped partners, wives or husbands by nightfall…” (p. 33). Predictably, unstable, “Hollywood” marriages were were the norm among the colonials. She was great fun and very witty and never made any bones about morphine. She always looked marvelous. She would be quite open about it, digging the needle into herself while we sat up drinking whisky. She never went to bed until 4 a.m. Next morning, we were always hung over and sleeping: but she was up at 8 a.m. beautifully dressed, and looking lovely, as if nothing had happened (p. 37). In Part Two, Fox catches up with some of the former colonials. He finds that many are still in Kenya and still enjoying “the good life” despite the many changes. However, not all of Kenya’s whites are so lucky. Fox finds one man, Dan Trench, whose family once owned a hotel and a distillery. At the time of Fox’s visit, Trench is an alcoholic, living in a wooden box by the ocean. Trench is emaciated and covered in skin cancers. During his interview, Fox picks at a fish that he doesn’t want to eat, but continues drinking, despite warnings that he must stop. Fox’s prose describing this scene is especially powerful and will stick with readers after they finish the book. 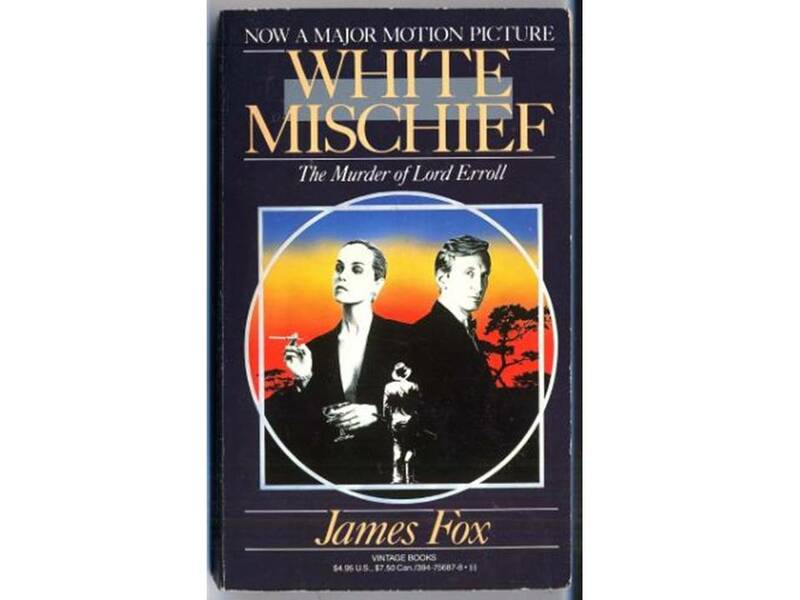 The colonial setting and the time (roughly the 1920s to 1941) are “characters” in White Mischief. The book would not be the same – or as strong – without these two elements. Part II focuses on Fox and Connolly’s attempts to solve the crime. As noted, Part II is a problem. One issue is that Fox runs through several “what if?” scenarios, but he does so in a way that is both difficult to follow and uninteresting. In these scenarios there are so many characters that Fox confuses his reader. (There is a list of characters at the end of the book). But the biggest problem is Fox’s disjointed presentation; for instance, in one place (p. 191) he includes some obscure notes jotted by the deceased Connolly. Fortunately, the “what if?” scenarios come to an end. Then Fox shifts his focus to explaining what he thinks happened and to tracking down those who lived in Kenya during the early-1940s. This material is much better and Fox brings the book to a satisfactory close. There aren’t many books like White Mischief. It is a real-life mystery as well as a look into an exotic, vanished world. Readers looking for something different will enjoy it. This entry was posted in Books, Articles, & the Arts, Semi-Informed Reviews & Opinions and tagged Cocaine, colonialism, Cyril Connolly, Dan Trench, James Fox, Josslyn Hay, Kenya, Kiki Preston, Lord Erroll, morphine, White Mischief. Bookmark the permalink.